In his films, Nicholas Ray often contemplates the psychodynamic turbulence hidden behind facades of normalcy. Bigger Than Life, with its focus on the degradation of patriarch Ed Avery (James Mason) speaks to the repression which plagues the seemingly typical fifties nuclear family. In this way the movie looks forward to those of another director, David Lynch. Though Lynch has explored similar themes throughout his work, most notably in Blue Velvet (1986), it is in Twin Peaks: Fire Walk with Me where Bigger Than Life's influence is most strongly felt. A prequel to the landmark television series, Lynch's film is preoccupied for much of its running time with the circumstances behind the murder which had launched the original show. 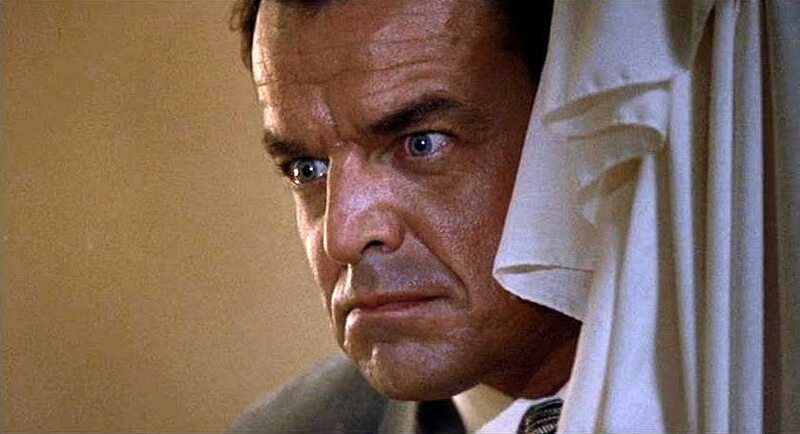 On TV, the causes behind homecoming queen Laura Palmer's murder are found to be supernatural, a demonic possession which absolves her father, prominent attorney Leland (Ray Wise), of much of the culpability for the heinous crime. Fire Walk with Me plays with the notion that Leland, psychotic though he may be, is the one to blame for his own actions, with the demon implied to be less a supernatural force than a symbolic representation of the evil within him, a signifier which only a visionary few can see. This new, more realistic (the qualifier "more" is necessary since Fire Walk With Me is still fairly fantastical) perspective frees Lynch to look at psychosexual reasons behind Laura's murder more clearly. Though genial and outgoing in public, the Palmer family household has the eerie stillness of tension. Sarah (Grace Zabriskie), Leland's wife, is a drug-addled manic depressive who reacts passively to the weird dynamic whenever they sit down for dinner. Laura (Sheryl Lee) leads a double life, high-school student by day, prostitute by night. And Leland is an obsessive compulsive, interrogating Laura about the cleanliness of her fingernails during one frightening incident at supper in a way that suggests a control-hungry despot with more intimate knowledge of his daughter Laura than even she is fully conscious of. Bigger Than Life's Ed, a repressed schoolteacher, is not motivated by such troubling spiritual torments. What bedevils him is physical, aches and pains that cause him to double over, eventually leading to a terminal diagnosis giving him less than a year to live. In one spookily lit scene which anticipates the red-curtained room where Leland could coexist with his personal demon, Ed stands behind an x-ray screen literally exposing his core, with the curtained backdrop cast red by a darkroom light. Ed is prescribed a controversial new miracle drug—the hormone cortisone—that should ease his pain and may extend his lifespan. At first, the effects of the drug are beneficial, making him feel "ten feet tall." It also has the unexpected side effect of dispelling the secrets between Ed and his wife—for a little while, at least; his mysterious sneaking off a few afternoons a week to moonlight as a taxi dispatcher is interpreted by his wife Lou (Barbara Rush) as an affair until his hospitalization brings it out into the open. But as Ed starts to overmedicate in order to sustain his growing sense of superiority he descends into a state of megalomania. The underlying problem between Ed and Lou, a lack of communication, returns with a vengeance. As Ed asserts obsessive control over his family—demanding Lou wear expensive dresses they can't afford, starving their son Richie when he can't complete a difficult math tutorial created by Ed, threatening on more than one occasion to leave Lou if she doesn't get with the program—he edges closer to a violent psychotic break. The respective arenas where each of the two films—Ray's and Lynch's—plays out are virtually identical in their layout: dining room prosceniums adjoining a living room at the foot of stairs in a two-story home. In Bigger Than Life, Ed confronts his wife about a nearly invisible peculiarity: their pitcher of milk has a depth mark revealing that about one cup's worth was already poured out to their son while Ed was trying to leverage starvation against Richie in his homework lesson. This prefigures the aforementioned fingernail scene in Fire Walk With Me, where Leland also obsesses over a seemingly inconsequential detail while terrorizing daughter Laura in their dining room. If most of the two movies' histrionics take place in the dining room, a communal room, the actual crimes are perpetrated upstairs in private. It is upstairs that Bigger Than Life's Ed attempts to murder Richie—a horrific act ultimately unconsummated—after a sermon at church makes him re-assess the biblical morality play of Abraham and Isaac in relation to his overblown appraisal of his family's flaws. Fire Walk With Me's Laura is not as fortunate as Richie; frequent nights are spent unsuccessfully resisting her father's sexual violations in her bedroom. Where Ray's antihero Ed self-medicates in an attempt to establish order, Lynch's far more sinister Leland can only impose order by drugging his wife and daughter in order to make them compliant. 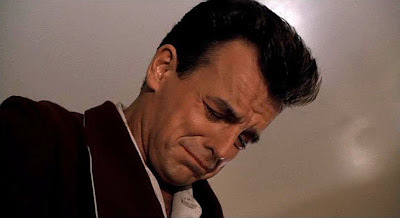 Leland's remorse eccentrically rears its head at ill-timed moments in which he bursts into tears. This symptom of the depravity which afflicts Leland is found much earlier in Ray's film, when Ed's newfound cure-all causes an hormonal imbalance which makes him burst into tears in the family den (a far more devastating sign of weakness in his present day, the 1950s), which he unsuccessfully tries to hide from his family. Ultimately, Bigger Than Life and Twin Peaks: Fire Walk with Me find different conclusions to their similar investigations. Fire Walk with Me determines that suburbia is an excellent blind which the depraved can use as a refuge. 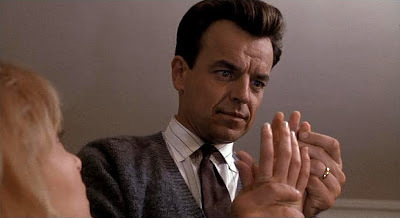 Leland Palmer manipulates his surroundings to form a cover for his actions. Ed Avery's desire for grandiosity has him longing for an escape from the dull life in the suburbs and spurs his self-destructive addiction. Bigger Than Life assigns the deadening effects of secluding oneself in the suburbs as the causal factor in his family's near-destruction. This is a revised version of a review first published on March 29, 2010. Nice observations that hadn't occurred to me. I've been noticing lately - especially when viewing some noirs - how many homages Lynch (who supposedly "never watches movies") makes to older films. I wonder if the connections here are coincidental or conscious; in a way, Lynch and Ray were after similar emotions in their work - teasing out that sense of feeling raw and exposed, albeit through entirely different methods and in wildly different frameworks. That said, I found Fire Walk With me overpowering and Bigger Than Life disappointing. Given Ray's penchant for putting us inside his wounded characters' heads, I had expected to experience Ed Avery's psychosis on a more subjective level - instead it felt like we were on the outside looking in. By the way, though I didn't end up writing on it (thankfully, as it turns out), I did watch King of Kings a few days after the blogathon. I found it largely a bore though I know it has its defenders. Out of curiosity, what's your take on it? After meeting Lynch in person, hearing him talk, and getting a feel for the very nice man, I must admit I saw his "feet of clay" a bit. (Never meet your heroes, they always say.) The subject of whether he watches movies (with specific ones mentioned in relation to his work) came up, and he again gave his stock response. I believe him. But I also believe he's seen a lot of these movies, maybe when he was younger or maybe when he was in school, and like many artists, absorbed them into his psyche without necessarily making note of them. So I would say, that his "homages" are probably a byproduct of that and perhaps input he received from others during his collaborative process like a DP, etc. I'm not sure every good idea or reference, or even a large part of them, come directly from Lynch (especially after reading a lot about the collaborative processes behind the scenes in Mark Altman's TWIN PEAKS: BEHIND THE SCENES. Frequently, Mark Frost and the rest of the writers had accounted for many of the loose ends that we saw crop up onscreen because Lynch would fly in to direct a significant episode and throw out much of the plot. That's not a judgement, by the way, because i'm happy with the results. But he does tend to wing it to some degree, which shouldn't surprise any of us. Who's to say he's not taking suggestions from everyone involved? 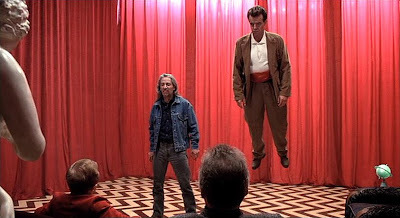 I think what Lynch does best is synthesize a lot of disparate story elements into something cohesive that at least makes a dreamlike sort of sense if not a literal kind. Sometimes his "quotes" from other movies are so evident, though, that there's no escaping that somewhere along the line he saw a given film. DUNE, a movie about a messiah, has many direct links to George Stevens' THE GREATEST STORY EVER TOLD, including scenes where characters here their own internal monologues in the form of a whisper, the casting of Max von Sydow (who played Christ in the earlier film) as the messianic character (at least he was in the novel DUNE) of Dr. Kynes and the casting of Jose Ferrer (who played Herod Antipas in the earlier film) as an emperor who also fears losing his kingdom to a cult leader. Doesn't the fact that Lynch attended AFI under the stewardship of Stevens' son, only a few years after the release of Stevens, Sr.'s film make it possible that GREATEST was viewed as part of the curriculum? I think so, but I digress. Interesting point. Though I did not find the style of the film engaging, I was intrigued by the narrative shift to Barabbas. In terms of its screenplay at least the film was certainly not a by-the-numbers religious pic. That said, though, another film I saw recently highlighted the films drawbacks for me. The film was "Son of Man," a British TV play from the 60s by Dennis Potter which portrays Jesus as the half-wild madman he probably was (that's not a knock by the way; I found the Christ in this film far more engaging and worth following than any I'd seen in any other). I'd place it as the best Christ film bar none (yes, moreso than the Pasolini and Scorsese). I know it's probably something I should get past, but the dead-air dubbing in KoK didn't help me either... Ryan was great. In my experience, John the Baptist usually steals the show (as the hammy and somewhat frightening Heston does in Stevens' version). As for Lynch, it's interesting to think of him as a collaborative director since his vision is so individual. Yet when you look at the collaboraters he's used time and time again, it's clear he thrives on symbiotic relationships with other creative individuals. Maybe the most underrated and key is Johanna Ray (though obviously Lynch has to a have a huge hand in the casting himself). I mean what would his films be without those brilliant and who-woulda-thunk-it casting coups?